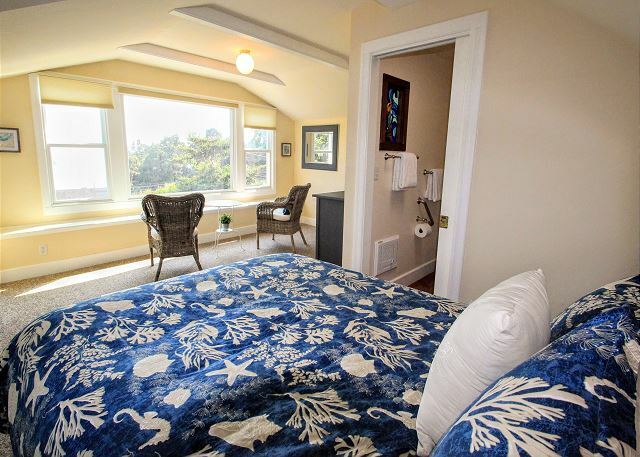 New as a rental, historic La Bella Vista offers truly exceptional ocean views from almost every room. 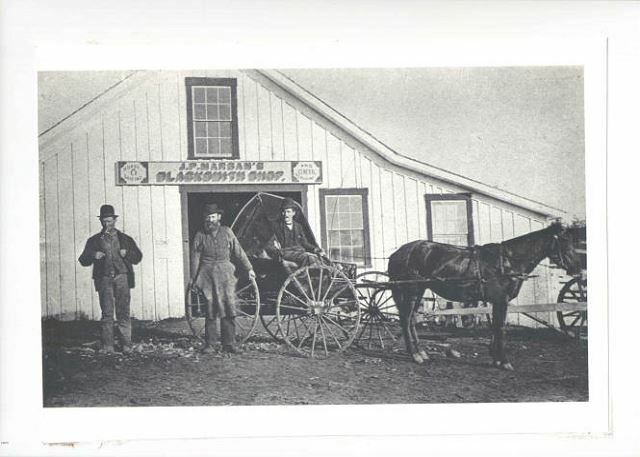 Originally the Marsan’s Blacksmith Shop in the 1800's, this home allows you to experience a piece of history. 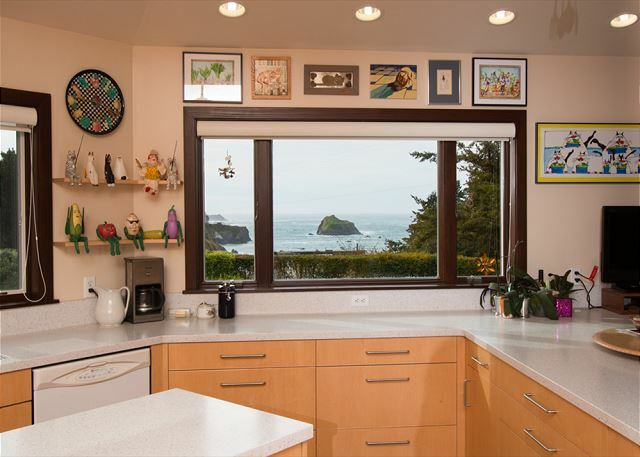 The custom kitchen offers mesmerizing coastal views. 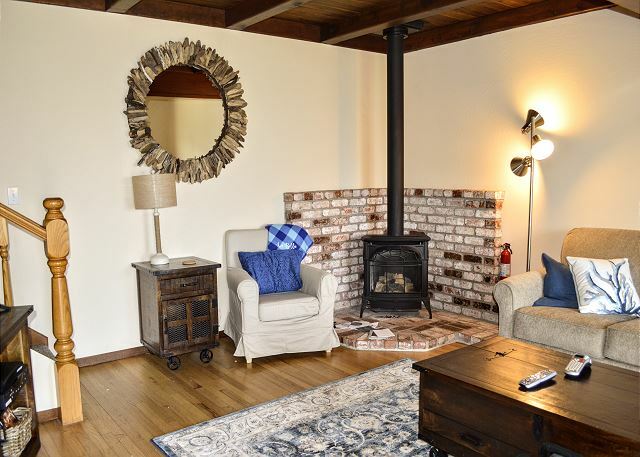 If you don’t feel like cooking, Little River Inn and Wild Fish Restaurants, are just a short ½ mile walk or car ride away, as well as the many dining opportunities offered just two miles away in the Mendocino Village. 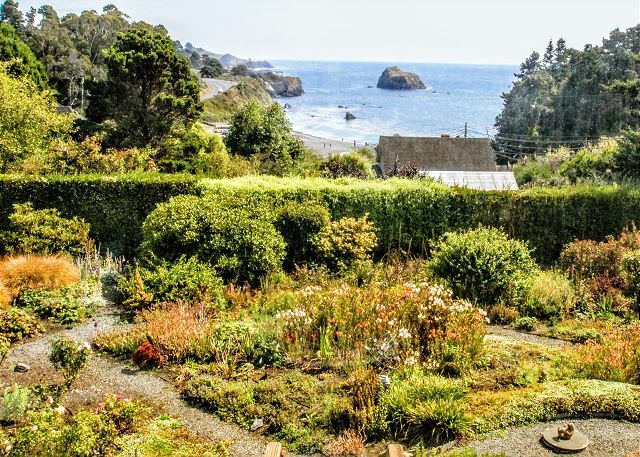 The tranquil gardens allow you to sit back and unwind while gazing out at the ever-changing Pacific Ocean. From the spa, deck or patio enjoy the sounds of the surf while watching the many seabirds and wildlife. 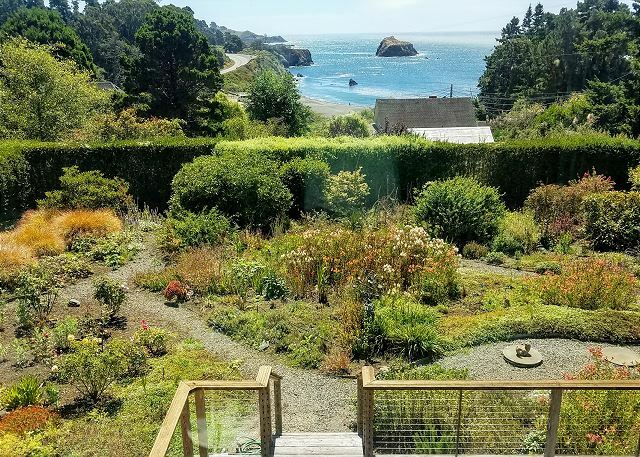 Perched above Van Damme State Park and just a short distance from the Mendocino Village this home offers endless opportunities to make your stay unforgettable. A short walk from La Bella Vista on the trail leads you to the scenic beach below. 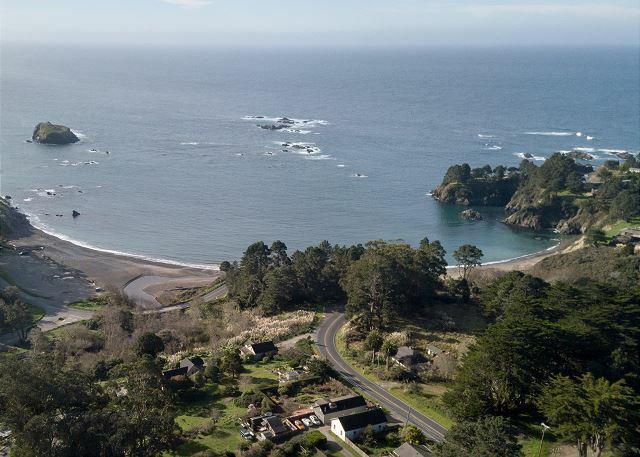 Here Kayak Mendocino offers professionally guided sea cave tours where you can experience the beauty of the ocean while sitting on top of an ocean kayak. 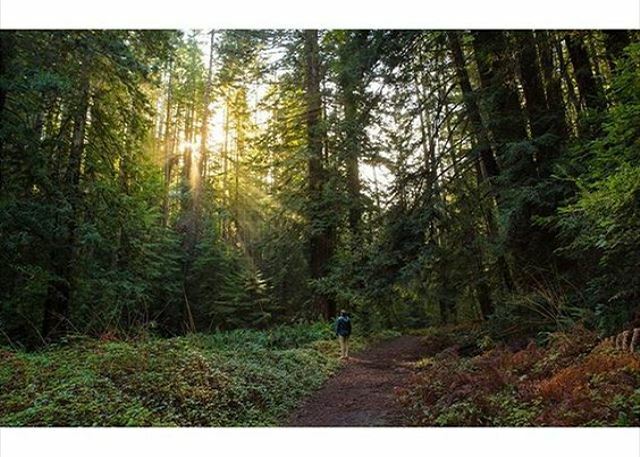 Across the street from the beach is Van Damme State Park that includes the Fern Canyon Trail system offers hiking through acres of lush fern and pygmy forest. 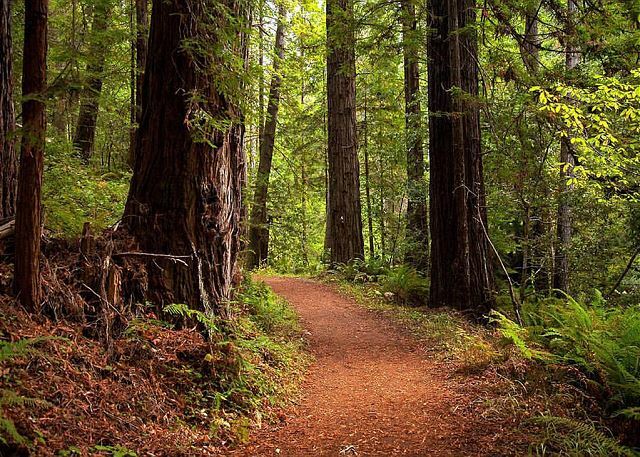 Also direct access to the Spring Ranch Preserve trails with great hiking and biking along the scenic cliff line. Like to golf? The Little River ocean views golf course is just a half mile walk or car ride away. No matter what your interests, there is something close by. La Bella Vista is the perfect location to make once in a lifetime memories. ~Please note:~ La Bella Vista is located immediately off of Highway 1 in Little River, while this is a slow stretch of single lane highway, guests that are light sleepers or sensitive to noise may be disrupted by the road noise. 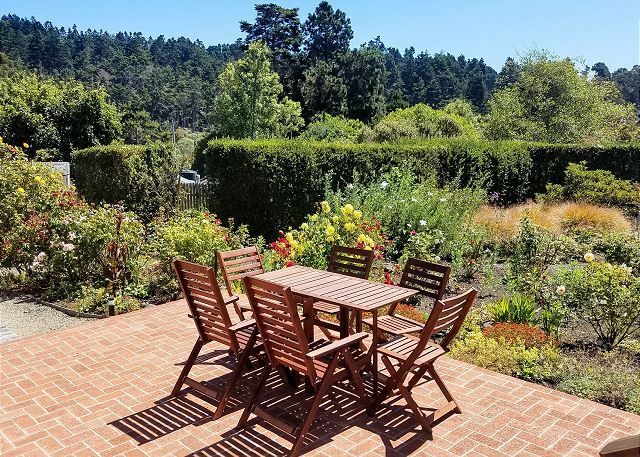 Beautiful property, gorgeous views, prime location. The internet pictures do not do this rental justice. Highly recommend! 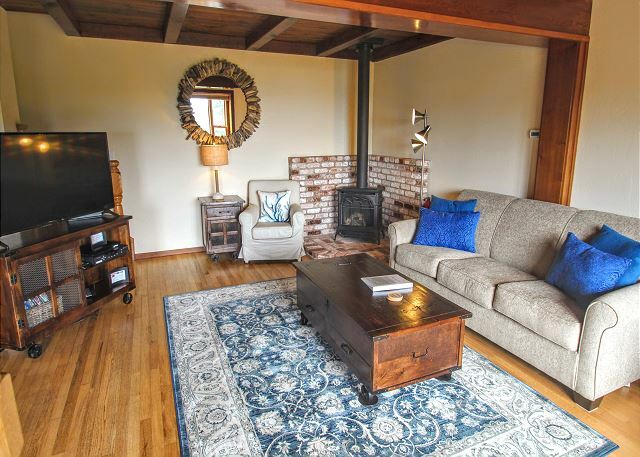 This is a beautiful home with everything I needed for a weeks getaway. 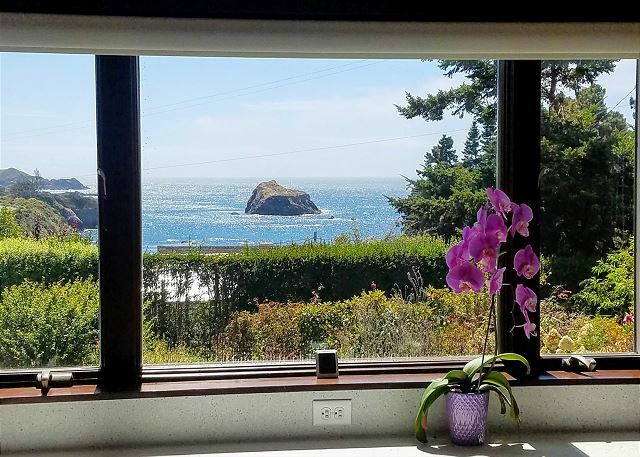 The view is spectacular from every room! 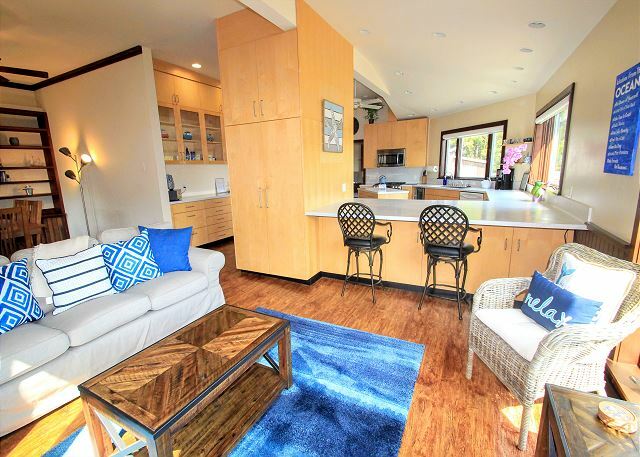 It has all of the modern conveniences, especially the kitchen. 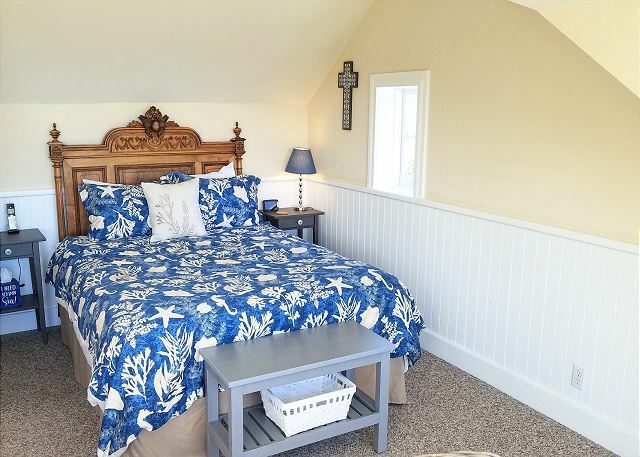 The master bedroom is very comfortable and quiet. 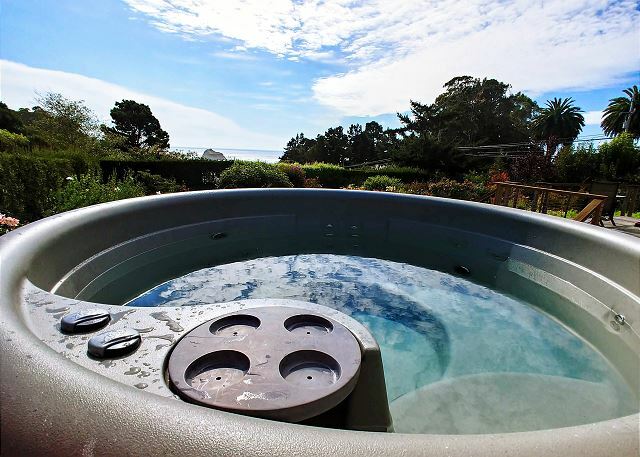 The hot tub is great and has a fantastic view of the ocean. It is very private yet close to everything. We were there in the month of February and had 2 days of rain. It was beautiful to sit inside and watch the stormy ocean. There is a bit of road noise, however, it never bothered us. We could not hear any traffic from the master bedroom. This is a great place any time of year and we will definitely be back. 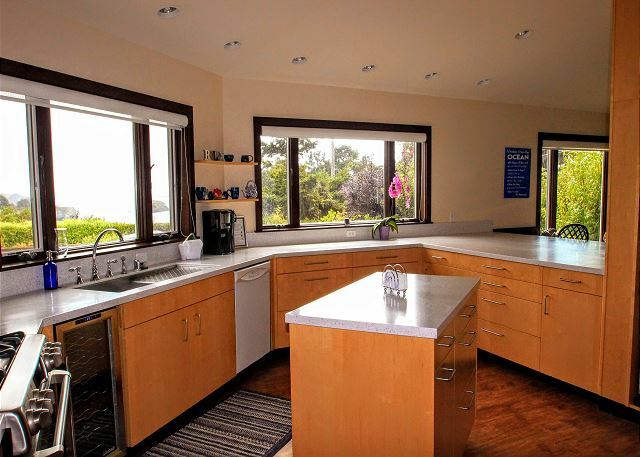 We enjoyed the view, the size of the kitchen, sitting space near kitchen and dining room. There were only 3 of us so we didn't use the living room. The upstairs bedroom was wonderful. The house is on the highway and there was significant road noise in the downstairs bedroom. Next time I'll ask the street address of a property to see how close it is to the highway. I think the road noise would not be a problem for kids but it was for our family of three. The yard is fenced so there is not a safety issue. There was plenty of parking. That being said, the view, the ocean sounds, the well maintained yard, bird watching and places to walk without getting in the car were all most appreciated. We spent 10 lovely nights in this charming home that we found very comfortable. 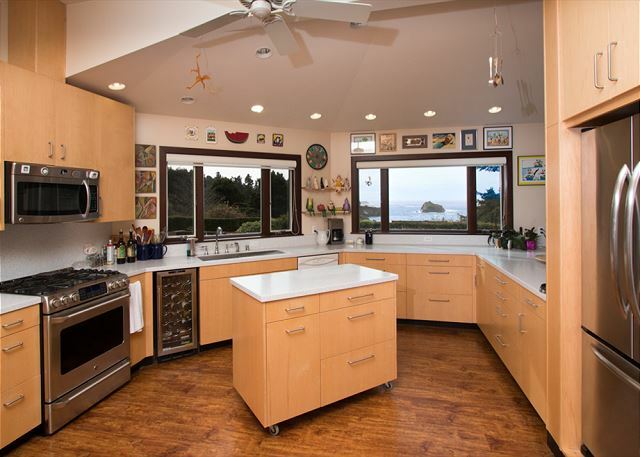 The ocean view is beautiful and the kitchen is very well stocked. The home was spotless! We truly enjoyed our stay! 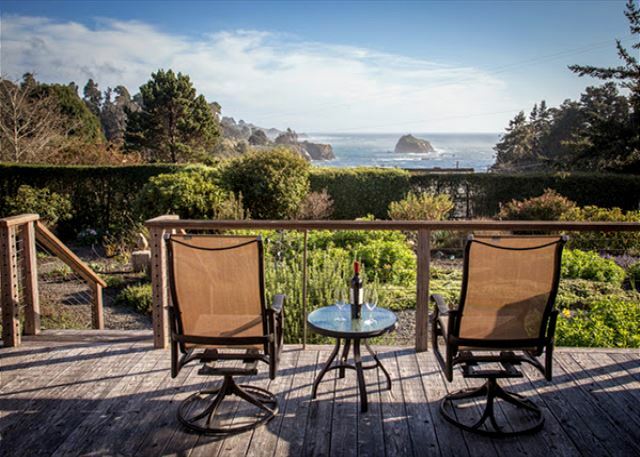 Mendocino Preferred is the best agency we have ever rented from. This is our third year with them. They are so easy to work with and very quick to address any issues or answer questions that might come up. La Luna Tratoria is a wonderful newer Italian restaurant in Mendocino and they will do takeout! Their minestrone soup is excellent. 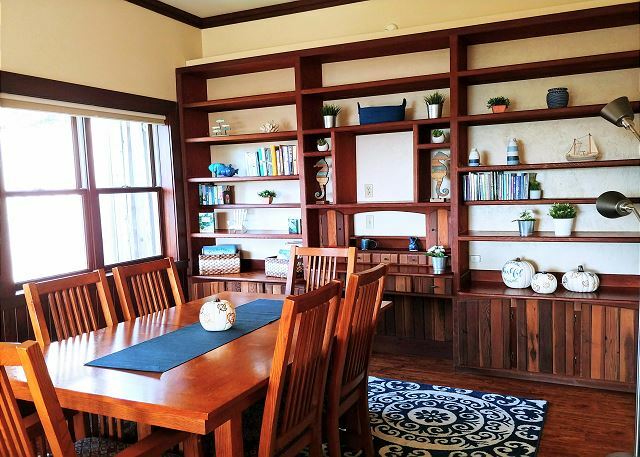 La Bella Vista is a beautiful home with spectacular views. The garden is wonderful and it was great to relax on the deck. 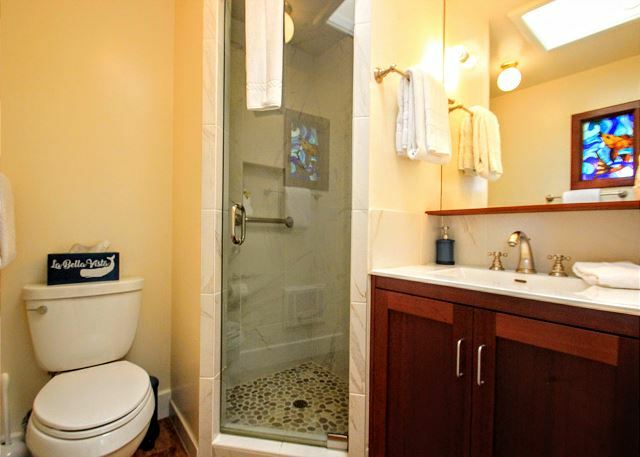 The home is well equipped and was immaculate. 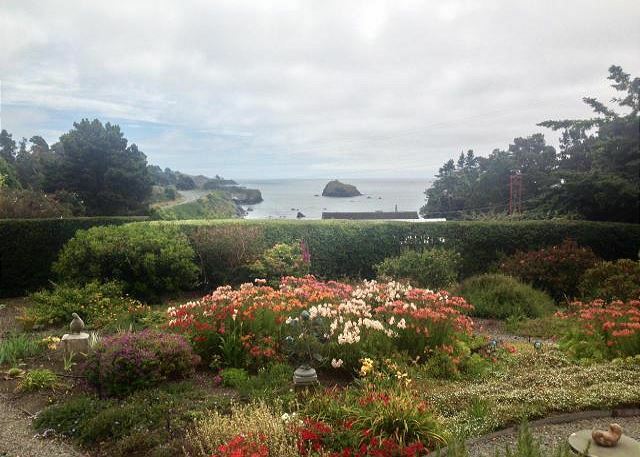 We hope to return on another visit to Mendocino. When we pulled into the driveway my wife and I thought our rental was a barn. Boy, were we mistaken. We opened the door to a 5 star experience and view. 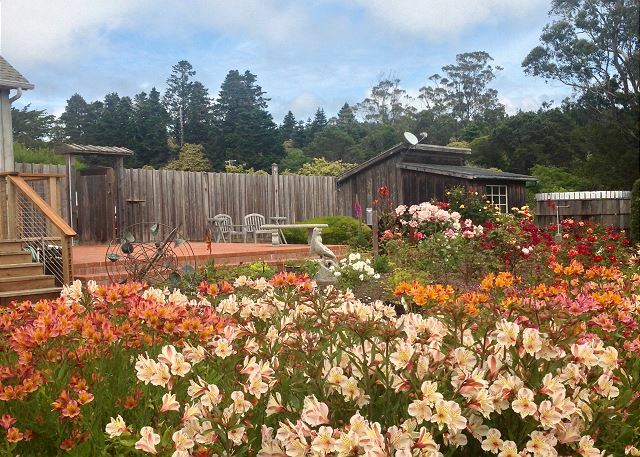 Enjoyed magnificent view from deck surrounded by profusion of color from flower garden. Great evening cookouts and cocktails and a dip in hot tub followed by walk to Van Damme beach. After kayaking the Big River had a local beer and meal at one of our favorites, Patterson's Pub. Also really enjoyed a couple breakfasts at Goodlife Cafe and coffee at Moody's. Good lunches at Flow with great ocean view. Even saw a group of whales. Enjoyed strolls around town visiting the many great shops with unique items. Not to be missed is the butter pecan toffee at the 2nd floor candy shop. Wow. Enjoyed plays by very good local actors at Mendocino and Ft. Bragg Performing Arts. This rental is perfect. Very well located to everything, comfortable, esthetic and clean and extremely well equipped for cooking. If you forgot anything at Mendocino Grocery there is a great gas station and well stocked grocery 1/4 mi. south of La Bella Vista. 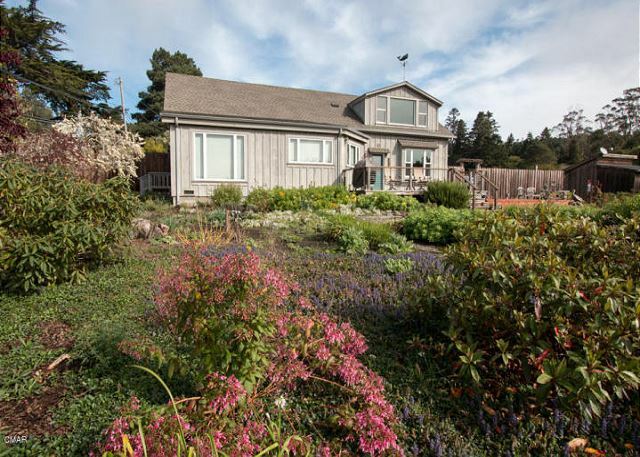 The management company, Mendocino Preferred, is friendly and responds in a flash. Wonderful place for relaxation, fun and building memories.